Success for the reigning World champions; the host nation’s Maharu Yoshimura and Kasumi Ishikawa stamped their authority on proceedings to emerge successful in their opening round Mixed Doubles encounter on Friday 8th June at the Seamaster 2018 ITTF World Tour Lion Japan Open in Kitakyushu. The top seeds, they beat Chinese Taipei's Chuang Chih-Yuan and Chen Szu-Yu , in three straight games (11-5, 11-3, 11-7); likewise there was an imposing performance from Hong Kong's Wong Chun Ting and Doo Hoi Kem, the no.2 seeds, they accounted for Romania's Hunor Szocs and Bernadette Szocs (15-13, 11-3, 15-13). 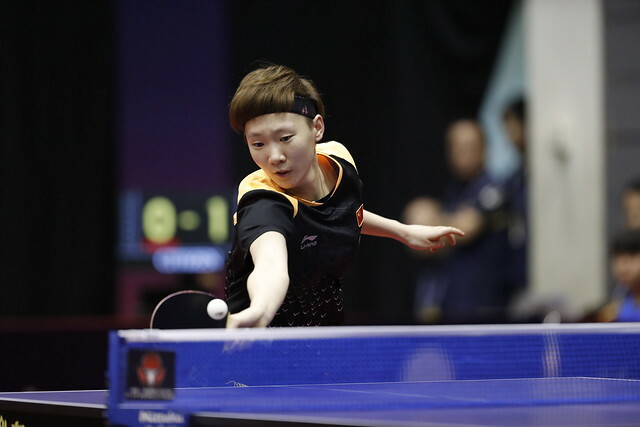 Similarly, for the pair Maharu Yoshimura and Kasumi Ishikawa beat in the Düsseldorf final, there was success but in much different circumstances, there was a close call for Chinese Taipei’s Chen Chien-An and Cheng I-Ching. Occupying the no.3 seeded position, Chen Chien-An and Cheng I-Ching needed the full five games to overcome a most formidable partnership in the guise of China’s Yu Ziyang and Wang Manyu. They emerged successful by the minimal two point margin in the deciding game (9-11, 12-10, 11-9, 8-11, 12-10). Defeat for one Chinese pairing but for another there was success; Liang Jingkun and Chen Xingtong, the no.8 seeds, accounted for Spain’s Alvaro Robles and Galia Dvorak (11-7, 11-6, 10-12, 11-3) in a round where matters advanced very much according to status. Just one seeded pair experienced defeat, Sweden’s Mattias Karlsson and Matilda Ekholm, the no.5 seeds, lost to the host nation’s Tomokazu Harimoto and Miu Hirano (11-7, 11-6, 11-6). Success for two Japanese pairings it was the same for Hong Kong and for Korea Republic but very hard earned successes. In addition to Wong Chun Ting and Doo Hoi Kem, Ho Kwan Kit and Lee Ho Ching, the no.4 seeds, emerged successful. They recovered from a two games to nil deficit to beat Thailand’s Padasak Tanviriyavechakul and Suthasini Sawettabut in a full distance encounter (9-11, 6-11, 11-8, 11-9, 11-8). Meanwhile, for Korea Republic, Jang Woojin and Jeon Jihee, the no.6 seeds, overcame Singapore’s Gao Ning and Yu Mengyu in a nail-biting five games encounter (4-11, 11-9, 11-3, 7-11, 14-12); in an almost equally hard fought duel, Lee Sangsu and Choi Hyojoo, the no.7 seeds, ended the hopes of Slovakia’s Lubomir Pistej and Barbora Balazova. Like Ho Kwan Kit and Lee Ho Ching they lost the opening two games before recovering to achieve success (8-11, 11-13, 11-8, 12-10, 11-8). At the quarter-final stage Maharu Yoshimura and Kasumi Ishikawa meet Jang Woojin and Jeon Jihee, Lee Sangsu and Choi Hyojoo oppose Chen Chien-An and Cheng I-Ching. In the opposite half of the draw it is Ho Kwan Kit and Lee Ho Ching versus Tomokazu Harimoto and Miu Hirano; Liang Jingkun and Chen Xingtong in opposition to Wong Chun Ting and Doo Hoi Kem.